The Universe's light-element abundance is another important criterion by which the Big Bang hypothesis is verified. It is now known that the elements observed in the Universe were created in either of two ways. Light elements (namely deuterium, helium, and lithium) were produced in the first few minutes of the Big Bang, while elements heavier than helium are thought to have their origins in the interiors of stars which formed much later in the history of the Universe. Both theory and observation lead astronomers to believe this to be the case. The predicted abundance of elements heavier than hydrogen, as a function of the density of baryons in the universe (expressed in terms of the fraction of critical density in baryons, Omega_B and the Hubble constant, h). In the 1950's and 60's the predominant theory regarding the formation of the chemical elements in the Universe was due to the work of G.Burbidge, M.Burbidge, Fowler, and Hoyle. The BBFH theory, as it came to be known, postulated that all the elements were produced either in stellar interiors or during supernova explosions. While this theory achieved relative success, it was discovered to be lacking in some important respects. To begin with, it was estimated that only a small amount of matter found in the Universe should consist of helium if stellar nuclear reactions were its only source of production. In fact, it is observed that upwards of 25% the Universe's total matter consists of helium---much greater than predicted by theory! A similar enigma exists for the deuterium. According to stellar theory, deuterium cannot be produced in stellar interiors; actually, deuterium is destroyed inside of stars. Hence, the BBFH hypothesis could not by itself adequately explain the observed abundances of helium and deuterium in the Universe. Thanks to the pioneering efforts of George Gamow and his collaborators, there now exists a satisfactory theory as to the production of light elements in the early Universe. In the very early Universe the temperature was so great that all matter was fully ionized and dissociated. Roughly three minutes after the Big Bang itself, the temperature of the Universe rapidly cooled from its phenomenal 10^32 Kelvin to approximately 10^9 Kelvin. At this temperature, nucleosynthesis, or the production of light elements, could take place. In a short time interval, protons and neutrons collided to produce deuterium (one proton bound to one neutron). 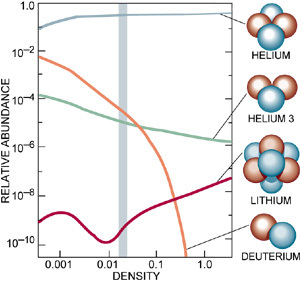 Most of the deuterium then collided with other protons and neutrons to produce helium and a small amount of tritium (one proton and two neutrons). Lithium 7 could also arise form the coalescence of one tritium and two deuterium nuclei. The Big Bang Nucleosynthesis theory predicts that roughly 25% the mass of the Universe consists of Helium. It also predicts about 0.01% deuterium, and even smaller quantities of lithium. The important point is that the prediction depends critically on the density of baryons (ie neutrons and protons) at the time of nucleosynthesis. Furthermore, one value of this baryon density can explain all the abundances at once. In terms of the present day critical density of matter, the required density of baryons is a few percent (the exact value depends on the assumed value of the Hubble constant). This relatively low value means that not all of the dark matter can be baryonic, ie we are forced to consider more exotic particle candidates. The fact that helium is nowhere seen to have an abundance below 23% mass is very strong evidence that the Universe went through an early hot phase. This is one of the corner-stones of the Hot Big Bang model. Further support comes from the consistency of the other light element abundances for one particular baryon density and an independent measurement of the baryon density from the anisotropies in the cosmic microwave background radiation. It seems like we really understand the physical processes which went on in the first few minutes of the evolution of the Universe!